A postcard from friend Rachel who’s currently touring around Australia. This has to be one of the longest wooden jetties in the world. In fact it IS the longest wooden jetty in the Southern Hemisphere – so long that you need to catch a train to get to the end of it. 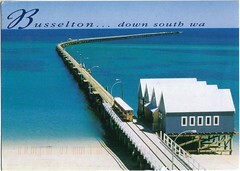 Busselton is a town in the south west region of Western Australia with a population of about 20,000.